At the front of Hakata Station, take a “Fukuoka City 100yen Bus“. Get off at the bus stop “Haruyoshi“. Walk to the same direction as the bus, turn left at the first signal “Sanko-bashi”. 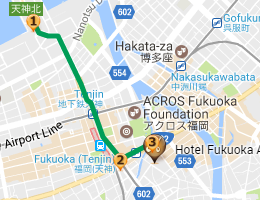 Please use an Airport Access Bus which goes directly to Tenjin area with 500 yen, if you arrive at the Fukuoka Airport by domestic or international flight. For reservations and timetables, please see the official airport bus page. Get off at the bus stop “Tenjin / Fukuoka City Hall”, and go along the street between Tenjin Central Park and Saiseikai Hospital. 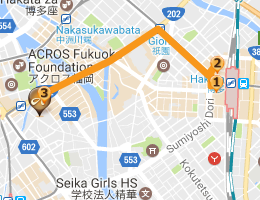 We are the 4th building on your right, past the “Sanko-bashi” intersection. 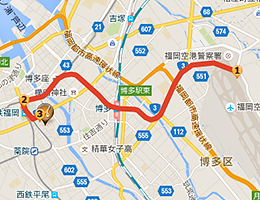 Take a Subway from Fukuoka Airport Station to Tenjin Station. Leave the ticket gate at Tenjin station, walk through the Tenjin underground shopping area and head towards the Nanakuma subway line. Go out to the ground from the exit #6 nearby the Subway Nanakuma Line “Tenjin South Station”, and turn right immediately. At the first traffic light, “Sanko-bashi” intersection, turn right. From Nishitetsu “Fukuoka Station” and Tenjin Area, go through the Tenjin underground shopping area and go to the Subway Nanakuma Line “Tenjin South Station”. Go out to the ground from the exit #6, nearby the Subway “Tenjin South Station”. 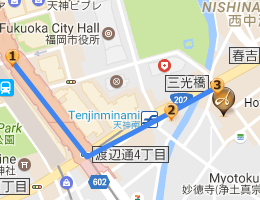 Get off the Urban Highway “Tenjin North“, and go straight for Wakaba-dori about 1.2 km (11 traffic lights). At the second traffic light “Sanko-bashi“, turn right.